The crater lake of Paniri is the highest place on Earth where crustaceans have been found. Paniri is part of a volcanic belt running through the Antofagasta region of Chile. Paniri is a stratovolcano located in Chile’s El Loa Province, near Chile’s border with Bolivia. The volcano is part of the San Pedro-Linzor volcanic chain. San Pablo and San Pedro (the twin volcanoes) lie to its northwest, while Cerro Del León lies to the southeast. Paniri is separated from Cerro Del León by the Cerro Chao lava dome. The stratovolcano has a cinder cone on its peak. Lava that flows from the volcano is preserved on the southwest flanks. The volcano features three summit craters and a single vent, and one of the craters contains a crater lake. The foot of Paniri is formed by thick lava, and its southeastern slope shows evidence of glacial activity. The western and northern flanks of the volcano have roads, and the town of Cupo is located to the west-southwest of the volcano, while the town of Turi is located to the south-southwest. 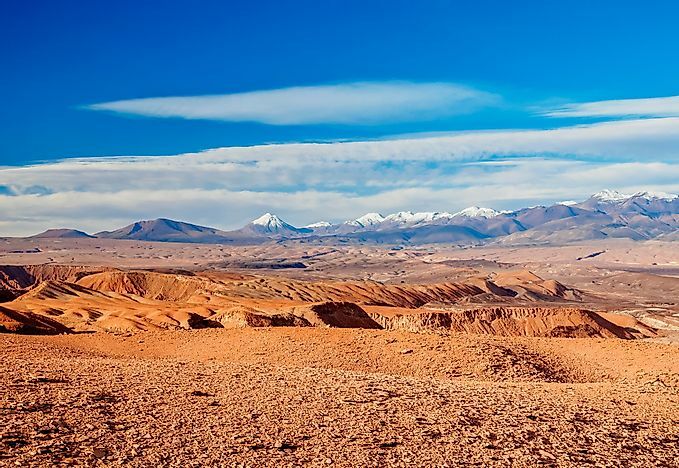 The Paniri, together with the Ubinas, Sabancaya, Lascar volcanoes and the El Tatio geothermal field and other geothermal fields, form a volcanic belt in the Andes known as the Central Volcanic Zone. Development of the volcano occurred in different stages. First, a shield-like volcano was formed that makes up most of the volcano’s volume. Later stages involved the formation of the main edifice and cone. Rocks of the Paniri vary from black volcanic rocks (basaltic andesite) to igneous volcanic rock (dacite). Subduction of the Nazca Plate under the western margin of South America is responsible for the Central Volcanic Zone volcanism. Paniri was primarily formed during the Pleistocene age. Some parts of the volcano have encountered hydrothermal alteration and glacial erosion. The volcano's basement consists of ignimbrites of Miocene age and Oligocene-Miocene sediments from rhyolitic and rhyodacitic material. On top of the basement is the San Pedro-Linzor complex, which is composed of pyroclastic flows and lava flows. Rocks of the Paniri range from rhyolite to basaltic andesite. Phenocrysts of the volcano have varied composition and include opaque minerals, olivine, hornblende, biotite and quartz. Archeological remains of Inka origin have been found on the peak of Paniri. In 2009, Branchinecta brushi, a species of fairy shrimp, was discovered in the crater lake of Paniri. The people of Ayquina village consider Paniri a sacred mountain. Dacitic rocks were sourced from the volcano. The longest lasting and most voluminous phase of Paniri’s volcanic activity was the shield stage. The shield stage was made up of two units: the lavic Malku units in the northwestern zone of the volcano and the Los Gordos unit in the north-northwestern zone. The Los Gordos unit is made up of breccia and pyroclastics laval flows. The Las Lenguas unit made of block lava flows was later established. The Las Lenguas unit is also made up of thin pyroclastic deposits. The Las Negras unit is more restricted in exposure and forms igneous volcanic rock lava with pronounced dikes on the northwestern side of Paniri. The last units of Paniri are known as the Viscachas, Laguna and Llareta units.